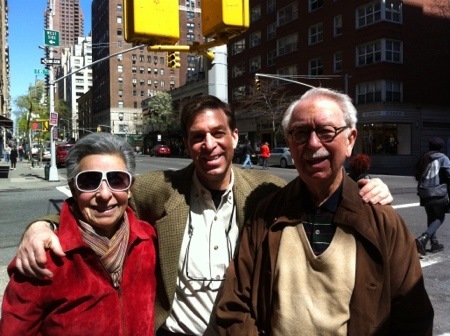 Jo-Anne and Martin Schneider in New York, May 2013. Their lifelong romance ended with his death on December 13, 2013. The mortality files of the city of New York, the city that he loved and where he of spent most of his life, will formally record that Martin Herbert Schneider was born on March 30, 1924 and died on December 13, 2013. Those are the statistical facts. But what actually happened is that Martin died two days earlier. He stood on the corner of 59th Street and Madison Avenue, ready to board the bus. A prosperous lawyer still engaged in a distinguished career, he could easily afford a driver. He certainly looked like he could afford a driver. As he grew older Marty became more handsome in his appearance and dress. His bright blue eyes. His full head of silver and white hair. His white moustache neatly trimmed. He stood straight, carried no cane, and could pass for a statesman. A senator. A judge. In Shanghai, young women wanted their picture taken with him. But he liked the bus. He liked to know that he was still vital, still capable of being on the streets of Manhattan. He liked to see and be seen. He never talked about growing old. Being old. He always looked forward to the next concert. The next trip. The next family event. And people noticed the elegant elderly man. His shoes were shined to high gloss. His tie, colorful and snug around the collar, was expertly dimpled below the knot. He was wearing a cotton shirt and gold cufflinks in the French cuffs. Gold cuff links and French cuffs. He’d just left his law office, saying goodnight to the aides and secretaries, the lobby guards, each of whom he knew by name. The law, of course, was at the top of his affections. But he was heading home to 86th Street where the truly great love of his life waited. Of all the ways that he excelled, of all the things that he had done in a life that spanned nearly 90 years, his lifelong romance with Jo-Anne Schneider was his single greatest achievement. And as he moved from one era to the next with her — from law student to boyfriend. From fiance to husband to son-in-law. From father to father-in-law to grandfather. From uncle to great uncle. From Cambridge to Queens, from Dobbs Ferry to White Plains to Sharon to Park Avenue. Those roles, those places, this man and this woman, like sugar cane in the field, grew stronger, heartier, and sweeter. And then it ended. Clean. Painless. Ordered. Effective. A mortal stroke. My mother says her husband of nearly 63 years died with his boots on. No he didn’t. He died with his hair parted, his trousers creased, and gold links in his French cuffs. And not a single regret. At least none that he ever expressed to me. What a life. Marty was born in Brooklyn, the oldest of three children, the first of two sons raised by Samuel Nathan Schneider, a Jewish Polish immigrant designer and maker of women’s coats, and Freda Schneider, his Jewish Polish-born bride. He was a good student, a loving son, a caring brother to Stanley and Suzanne. He learned to love Judaism and practiced its rituals, its values, its principles all of his life. He wasn’t a cut-up. Not once did I ever hear my father tell a story of the windows mashed, the guys carousing, the hearts he’d broken. He lived near his grandmother, who he visited every day on his way home from school. That’s not to say he was dull. He wasn’t. He was dutiful, canny, and instinctive like his father, who thrived in the Depression by being agile and fearless. At one point during the Depression Marty lived in New Jersey, where his father moved the family and the coat company, to pursue new markets and avoid union organizing. Marty was sweet, more emotionally vulnerable than he let on, and keenly intelligent like his mother. I once stayed with my Nana Freda in her house in Brooklyn. In the morning we watched Jeopardy. She could run the table on category after category. Marty studied accounting at CCNY. He served in an Army command during the war in an administrative position, most of it spent in the South and in California. He didn’t see combat but he came back a full grown man. He finished at City College, gained entrance and attended Harvard Law School, graduating in 1949. The war was a turning point. And from his telling, so was Harvard. Law school was a gas. All of it just fit. The exacting precision of the law, the details that required diligence in understanding, rigor in interpretation. Law was organized, structured. The law was like Marty. It was designed to bring order to disorder. The law provided other benefits. The law conferred stature, especially at an institution that educated presidents. The law was a path to doing good and doing well. The law attracted girls. By the late 1940s, with a war and a Harvard education under his belt, and a striking young Simmons College student on his arm, Marty Schneider was styling. 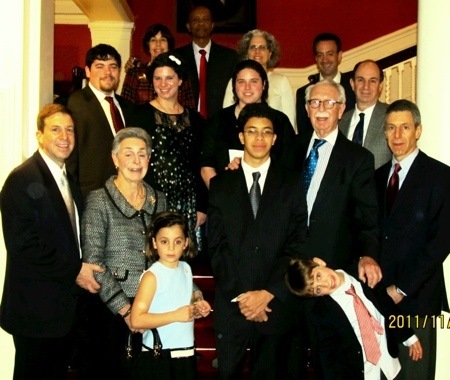 He and his law school classmates, many of them also New York Jewish veterans, some of whom became dear lifelong friends, played hard and studied hard. They practiced the gentlemen sports. Tennis. Golf. Lake fronts. Girlfriends. Scotch. They dressed like film actors — dark glasses, shorts, cashmere sweaters draped on their backs, the arms tied around their necks. They were suave and savvy. Trim and youthful. Ambitious and eager. They were the country. When Marty and his classmates left Cambridge and returned to New York, they didn’t need to storm the city’s established New York legal bar. They nimbly ran around it and took command. 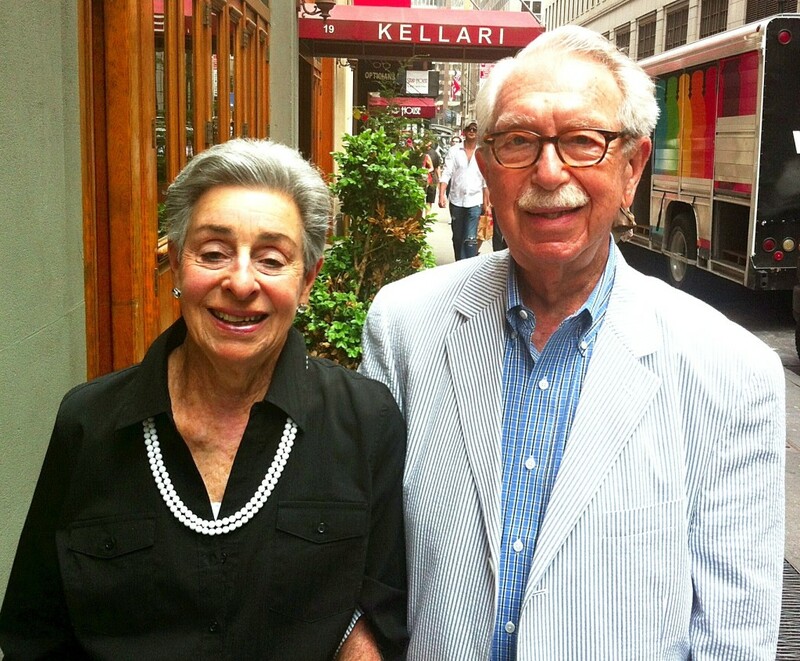 Months after graduation, Marty impressed the founders of a small Manhattan firm, who turned to each other and said something akin to, “Don’t let that guy out the door!” In February 1951, he married. Marty was accomplished at all of it. He spent the bulk of his career at one firm, rising to be not just a partner at Halperin, Shivitz, Scholer, Schneider and Eisenberg. He was the managing partner — a young man at the full measure of his skill in organizing, directing, making decisions, recruiting talent, attracting clients. The office at 11 East 44th Street grew very successful under his watch. It housed its skilled attorneys in a sleek Manhattan office with a modern, colorful and airy design ethic. Clients waited on beautiful Barcelona chairs. Art was original and colorful — the kind of art displayed at MOMA. A spiral staircase linked the firms’s two floors. As teenagers, we’d jump off the train at Grand Central and bolt over to see Dad. We’d be greeted by partners and staff like we were princes. Like family. Dave Shivitz. Harry Halperin. Peter Eisenberg. Marty revered them. And they knew what a talented and committed lawyer he was. At home in the 1960s and 1970s, we were a house full of the people Marty and Jo-Anne taught us to be. High-minded. Ambitious. Strong-willed. Independent. Things occasionally boiled. It’s common knowledge that I stirred quite a bit of it. But not all. The country was fighting a hated war abroad, and struggling with civic strife and change at home. Those external influences seeped into 78 Midchester Avenue in White Plains. Marty had really good sense about this. He let Jo-Anne take the lead in responding, in pressing us to excel, to earn grades and SAT scores and entrance to good colleges. He supported her, without question. Together they were a flood tide, irrepressible. Unyielding. Most importantly, he joined her in stressing assets of personality and performance that had led to success in their lives and ought to in ours. Sweating the details. Never giving up. Setting high standards. Always seeking to improve. By the 1980s, with his children out of college and, in his words, “off the payroll,” Marty was making his life look easy. Which is just another way of illustrating how hard he worked. How good he was at making choices, at orchestrating and living the life he wanted to live. A great movie is seamless. A great symphony flows. Great writing moves with unyielding energy and precision from start to middle to end. It’s hard work to achieve that sense of effortlessness. And it takes a little luck. He and Jo-Anne enjoyed very good health. And they were best friends and lovers. There was no sense of an empty nest on Midchester Avenue. No, they emptied it, moved to Park Avenue, and went out to play. They traveled to five continents. Sampled the good restaurants. Bought season tickets to the Philharmonic. Their kids, trained to succeed, turned out to be well prepared for the end of century America. And why not. There’s a lot of Marty Schneider in his children. Each of us excelled professionally. Three married well. And each of us raised terrific children. Reed has my father’s steadiness and expansive intelligence. Allison has his uncommonly good sense and sweetness. Grant has his emotion and creativity and steadfast will. I have his sense of adventure. I have his easy way and love of people. We also share the same shoe size. He’s got great shoes and over the years he agreed to part with a few pairs. I told him one day, “Dad, I can wear your shoes. But I’ll never fill them.” I thought that was pretty nifty. Heartfelt. He just looked at me. Didn’t say a word. Such direct attention and affection unnerved him. I figured it was a generational thing. And he had other qwirks. Before a play performance or a classroom presentation, he always reminded us to stand straight and “Don’t speak Chinese.” But he had such trouble speaking in public. He was just never comfortable being the center of attention. Even his family toasts seemed to be delivered by an awkward, puzzled man inhabiting Marty’s body. He finally got a grip on that. In his last appearance as a public speaker — an award luncheon in October honoring Jo-Anne’s lifetime achievement as a leader of the National Council of Jewish Women New York Chapter — he’d obviously practiced and seemed much more comfortable. He also had a curious way of acknowledging his family’s achievements. He could be so arch. Part of the reason Mom won the lifetime achievement award was her skill as a fundraiser. Marty greeted the news of her award not with a hug and happy congratulations. He assessed it this way. “That’ll cost you,” he said. That bit of hot chile was one of the ingredients that endeared him to his family and his friends. His nieces and nephews — Marian, David, Jonathan, Hillary, Sally, and Amy — loved the warmth and really attractive confidence. His grandchildren — Lauren, Mariel, Taylor, Margot and Graydon loved the open arms, the laugh. The fun. The ability to teach and connect. He was generous. Haverford College ought to name a wing for Marty Schneider. He put three boys through there, and a daughter graduated from Simmons. When I needed help to buy my first IBM PC and a daisy wheel printer in 1983, he loaned me the half I didn’t have. When I formed a non-profit group in Michigan in 1995, he put his shoulder to the enterprise and helped me build it. He was my New York development office. He was athletic and kept himself fit. He pitched in. He’d paint the den and then make the wooden covers for the steam radiators. He was good at fixing stuff. He was a good driver and photographer. He liked to tinker with gadgets. Raised in the era of radio and Kodachrome, he easily moved to digital cameras, personal computers, and email. He liked classical music and theater. He liked people. He’d walk the beach alone in Puerto Rico, talk to everybody, and return with a new friend. He had a sweet tooth and an instinct for finding bakeries. It was a rare for him to pass an ice cream shop. He loved to travel and to see. He’d visited China with Jo-Anne in 1986, when it was a lot like India still is — dusty, decayed, a little desperate and poor. It was a tough trip for them. Not comfortable and a bit emotionally wearying. But in 2010, after I’d come back from my first trip to China, raving about the high speed trains, the soaring Shanghai skyline, ultra-modern industrial plants, surging professional culture — he made a second trip in 2011. He came back raving, too. He was 87 years old. He loved to shop. He shopped with the same intent interest, and studied rationale that he brought to every other part of his life. The preparation. Considered choices. Sensible decision-making. Shopping also was direct acknowledgement that he could enjoy the fruits of his labor. His suits. His sweaters. His coats. His ties. All neatly tucked away. Every pair of shoes in its box, labeled, and stacked on shelves in the closet. 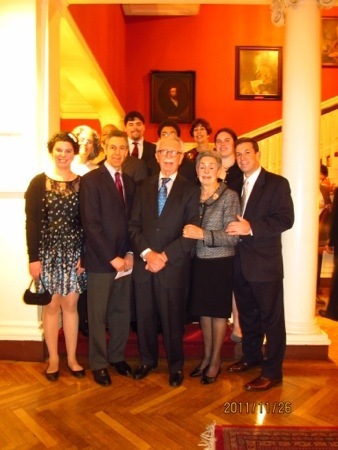 Three weeks ago Marty and Jo-Anne gathered the family for our annual Thanksgiving dinner at the Harvard Club. It’s a wonderful, august place on 44th Street where we’d celebrated lots of family events. Marty looked, as he always did, happy and healthy. Some of us looked forward to celebrating his 90th birthday in March. And then in June, Lauren and Jeffrey are getting married, the first wedding of a grandchild. He’d gotten everywhere else he needed to be. Where he wanted to be. Life is alchemy. Mix in the right elements and you can produce gold. And among all the elements needed for a successful life, three are the most important: Time. Love. Health. Martin Herbert Schneider had all three in abundance. He lived a long time. He had love, an abundance of love. He loved and he received love. His health was so excellent that a cruise to the Caribbean was in the trip preparation stage the day he died. I honor my father’s life. I celebrate its joy and accomplishments. I’m not alone. There is such unity in my family about who he is, and what he did with his many, many days. Martin Herbert Schneider is not breathing anymore. He lives, though. I feel him as I’ve always felt him. It’s the same for Mom, Reed and Allison and Grant, for Anne and Basil and Larry, for Lauren and Mariel and Taylor and Graydon and Margot. The life went out of Martin Herbert Schneider one December afternoon while he waited for a bus on 59th and Madison. A handsome, generous, lively, capable man, beautifully dressed, wearing french cuffs and gold cuff links. Still, he’s as alive as he ever was. I was beyond happy to meet and spend time with Marty and Jo-Anne Schneider this fall. They’ve each had long, illustrious, productive careers. Yet what impressed me most, what will abide with me and light the darkened corners of my psyche when doubt creeps in, was their obvious love for each other. The way they exchanged knowing, intimate glances. The way they looked straight into each other’s eyes, ignoring everyone and everything else if the other was speaking. The way they took each other’s counsel and watched out for each other’s welfare. Watching Marty and Jo-Anne was like viewing a fairy tale in real life. For all who’ve been inspired as I have been by their lifelong devotion, I say, keep on remembering. After reading your beautiful, loving tribute to your father, Keith, we know we would have been tremendously privileged to have known him. We extend our deep sympathy to your Mother, you & your siblings, and all your father’s loved ones in the loss of such an extraordinary man. He lived such a full and accomplished life, however, and his & your mother’s love story is so awe-inspiring, that hopefully all the warm and loving memories of him will help banish the sadness you all must bear in his absence. Keith, I just now bumped into your eulogy about your dear Dad. I did not know that he had passed. Your father would be so tremendously proud, indeed overwhelmngly but quietly proud, of your loving words about him. Your description of Marty is absolutely spot on. I worked for him, and then with him as a partner, for twenty years at Halperin Shivitz. Marty, Harry, Dave, Sam and Peter were one helluva team. Best forward my kind regards to your dear mother.